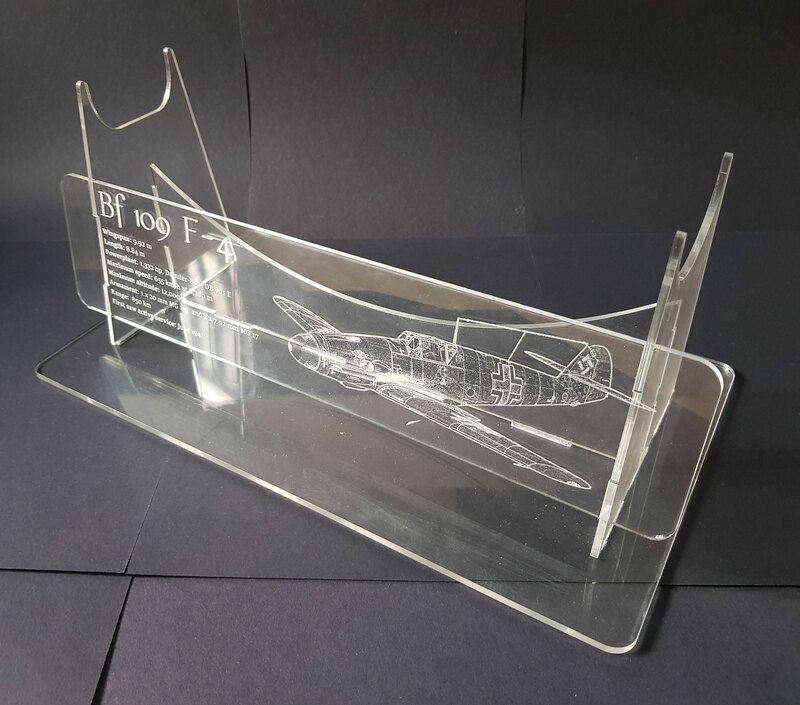 Would you be interested in buying a custom acrylic plane stand? Unfortunately, as of yet, there is nothing for sale from this post. however, those who came here looking specifically to buy something, please don't be disheartened, and continue reading. As a disclaimer, for now, this post is an inquiry into the number of people who would potentially be interested in a product. However if that interest is large enough, it may turn into something more. Some of you may have recently seen a post on a thread of mine where a showed off a stand for my latest build, that I had laser cut from 3mm acrylic. I started to think "would other people would also be interested in similar stands for their aircraft?" Obviously this stand was made specificially for my project, but I could easily come up with a few more generic designs to fit a wider range of aircraft. There are also a couple of issues with this current version that would need to be resolved if I were to produce stands for sale. The base is a little too large, and I simply overestimated how large a base I would need for the stand. An updated version would likely be similar in length, however slightly less wide. The base is made from 4mm acrylic and the rest of the stand from 3mm acrylic. This isn't exactly a problem, and was infact an intentional design choice on my part for two reasons. I wanted the base to be slightly thicker than the rest of the stand, and where I made the stand, scraps of material are free to use. There was only on hand 4mm acrylic in the scraps bin, opposed to the 6mm, for which I would have needed to buy an entire new sheet. (This turned out slightly differently anyway, but that's another story) However, in future to save cost, I would make the entire stand from 3mm acrylic. Doing this would allow me to put all the parts on one sheet of material, save material cost, as obviously the thicker the acrylic, the more expensive it is, and it would save weight, reducing shipping costs. So, on to the details! I would want to make a probably two or even three different sizes of stand, to fit various planes from flite test and generic RC models. Generally a stand for a fuselage size similar to the FT mighty minis, one for the planes similar to most FT aircraft, such as the spitfire, and maybe one for larger aircraft. Among these different sizes, there would be different end plates, to allow you to mount the plane in different orientations. With one larger and one slightly smaller end plate, the plane could be angled upwards or downwards. With some angled slots for the plane to sit in, it could also be banked left or right. 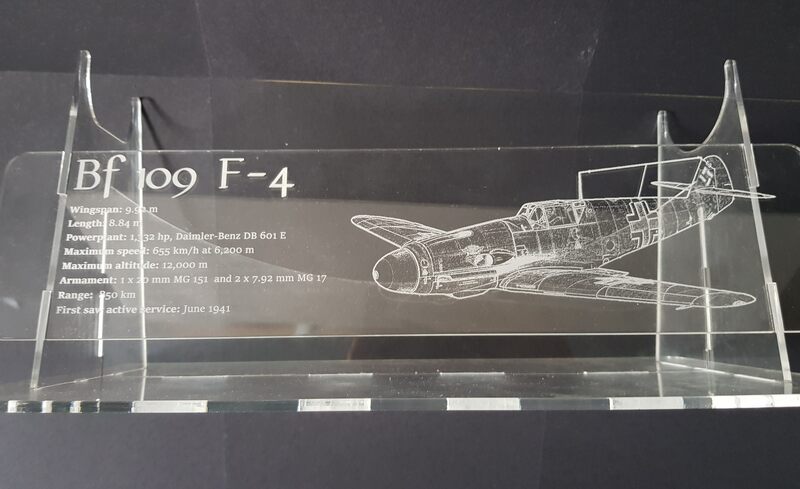 Finally, a specially designed base, perhaps with an information plaque extending from the bottom, could contain screw holes, to allow planes to be mounted against the wall. I could also include some small holes to allow for tie down straps. 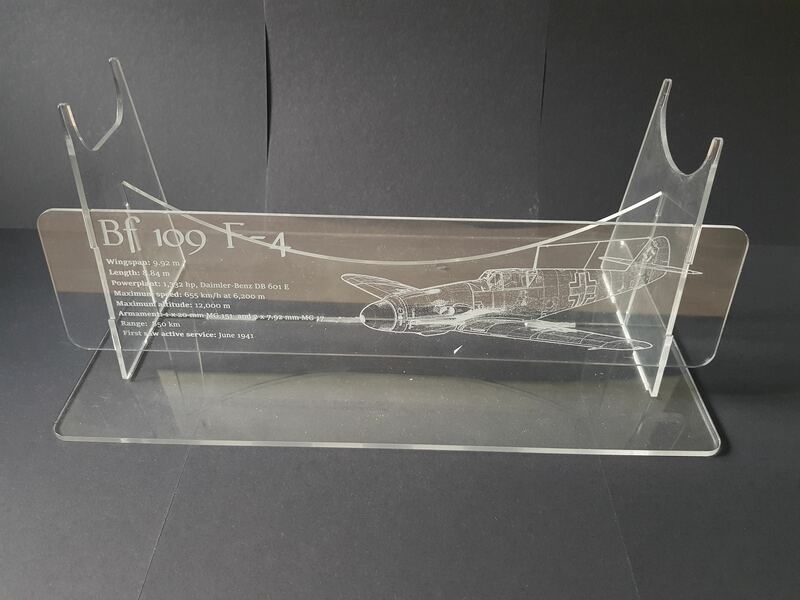 This would make the stand a lot more functional as well as decorative, so that you can take your aircraft places, and look good while doing it. It could potentially be a good idea to include a slot in the upright base parts for wing storage, since this stand should be as multifunctional as possible. The last thing I would potentially like to include are some information plates for common aircraft. Could include planes such as the spitfire, F4U corsair, P51 mustang etc. To clarify, I only listed these planes as they are popular FT designs, and the final range of information plates for aircaft would really depend on popular demand I guess? The stand would arrive as separate pieces, to be slotted together by the user. The reason for its un-assembled state, would of course be to save on shipping costs. As a load of separate parts, the entire stand could be shipped as a "large letter" rather then a parcel. I would assume (or at least hope) by this point some of you are wondering, "well how much would this thing cost?" Well, as of right now, it would be very difficult to say for a couple of reasons: The first is that the cost would vary depending on whether an engraved side plaque is included or not, as this could potentially double the time for each stand on the laser cutter. The second, which affects a whole host of other things, is that I don't know how many, if any, I would need to make. The larger the quantity I can make, the cheaper. I can source the perspex/acrylic in larger quantities, and therefore cheaper. Additionally, depending on whether I was producing these as a one offs, or as larger batches, I could greatly optimise the cutting process, by fitting multiples of the same part on each sheet and caring more about the quantity of acrylic used, rather than needing to produce one stand for every sheet of acrylic I buy. So, what this post is, is a general inquiry into whether anyone would be interested in these stands, and if so, would there be enough to justify setting up an online store, such as ebay, to sell them. (Just as a little after-note: This is a slightly absurd, and extremely unlikely outcome, but if there was really a lot of support, I could consider setting up a kickstarter, or indiegogo campaign to really open up potential customers.